See Dirt Run!™ Inc. of Germantown, MD., publishes chapter on Cleaning Cedar Homes in Power Washers Guide Book. 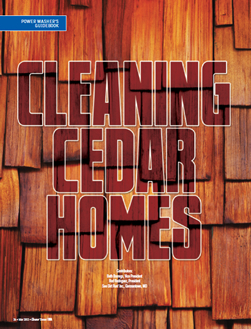 See Dirt Run!™ Inc. President Rod Rodriguez and Vice President Beth Borrego co-authored an updated chapter on Cleaning Cedar Homes for the Power Washers Guide Book published by Cleaner Times Magazine in March 2013. Germantown, MD – March 2, 2013 Rod Rodriguez, President and Beth Borrego, Vice President of Maryland based company See Dirt Run!™ Inc. were contacted back in November 2012 by Cleaner Times Magazine and were invited to contribute a chapter on Cleaning Cedar Homes to the revised Power Washers Guide Book. Rodriguez and Borrego candidly discussed geographical considerations, the typical job, techniques that work best, exceptions, equipment and supplies, and other relevant topics. See Dirt Run!™ Inc. was the only company to contribute to this chapter, and also provided photographs of jobs to accompany the text. See Dirt Run!™ Inc. of Germantown, MD, a local power washing company specializing in high end wood restoration and wood preservation, has been restoring and maintaining log homes cedar homes, decks, fences and more since 1999.